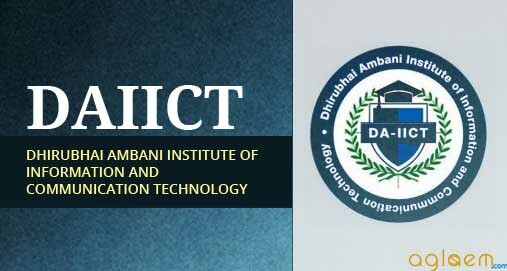 Home Institutes DAIICT DAIICT Application Form 2019 – Released! DAIICT Application Form 2019 – Released! 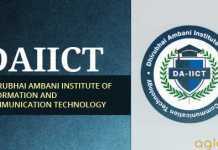 DAIiCT Application Form 2019 – The application form for DAIICT PG admissions are available. The candidates can fill and submit it online only. The candidates are advised to fill the application programme before the last date. Before filling up the application form make sure that the candidate satisfies all the eligibility norms. The application form should be filled completely with correct information in all aspects in order to prevent any rejection. The candidates can check the process to submit DAIICT Application Form 2019, important deadlines, and more related information from this page. Latest: New programme M.Tech (EC) has been added in DAIICT. Candidates can apply from the link given below. Candidates can fill their application form online through the official website of DAIICT. Candidates are advised must ensure their eligibility criteria before filling the application form online. The direct link to fill the application is also given below. Click here to fill the DAIICT Application Form 2019. Please submit the online application form in order to complete the application process. Application fee (non-refundable) is Rs. 1200/- (Rupees One thousand two hundred only). The Candidate has to satisfy the eligibility criteria in order for her/his application to be considered for admission into the desired program. The Candidate has to satisfy the eligibility criteria in order for her/his application to be considered for final admission. The admission to the candidates to the programs will be based on the All India Rank of Joint Entrance Examination 2019 (JEE-2019) Main, which is conducted by CBSE. Therefore, candidates who are appearing for JEE 2019 Main can only apply for these programs. The short-listed candidates, based on the All India Ranking of JEE 2019, will be offered admission (confirmed/waitlisted) in order of their merit (based on the All India Ranking of JEE 2019). Counselling will be done online. Applicants are advised, from the date of announcement of first merit list, to check for e-mail communications from the Institute to learn about the admission status and steps they need to take to continue with the counselling process. The candidates who have accepted admission offers will be asked to appear for registration, document verification and payment of fees. Subsequent to this there will be the orientation for those who have been given confirmed admission. Eligible Candidates who have not been invited directly for the interview are required to appear for DAIICT’s Ph.D. Entrance Test to be conducted at DAIICT Gandhinagar. The candidates shortlisted based on either their performance in the DA-IICT Ph.D. entrance test OR invited directly for interview based on their valid NET-JRF and/or M Phil degree. Direct Interview for candidates with valid NET-JRF/DST Inspire/PM scholarship/Visvesvaraya Ph.D. scheme at the time of application. In the interview, the candidates will be evaluated by a panel of expert faculty on foundational as well as specialized topics of their background and research interests. For this purpose, the candidates have to submit a one page statement of purpose as a part of their application. Final merit list for admission into the program will be prepared based on the written examination (wherever applicable) and/or the interview. Eligible Candidates need to appear for DAIICT’s Design Aptitude Test (DAT) conducted at DAIICT Gandhinagar. The online application procedure will guide you through the necessary steps for application fee payment, submission of the statement of purpose, registering for design aptitude test and appearing for the personal interview, Candidates for this program without a valid CEED score will be selected for interview through a Design Aptitude Test (DAT) to be conducted at DAIICT. The final selection will be based on the combined scores attained in the DAT, Statement of purpose (SOP) and the interview. The DAT will constitute 50%, SOP 20% and the interview 30% of the overall marks assigned to the admission test. Eligible Candidates have to appear for the entrance test conducted at selected centers across the country. The online application procedure will guide candidates through the necessary procedures for application fee payment, registering for the entrance test, and choosing the test center. Final merit list for admission will be prepared based on the aggregate score in the entrance test. The top 120 scorers are offered confirmed admission and there will be a waitlist. The candidates who have been offered confirmed admission will be given five days’ time to accept the admission offer by paying the relevant fees. If a candidate fails to pay the fees within the stipulated period, the offer of admission will stand withdrawn and the eligible candidate on the waiting list will be offered admission and she/he will be given five days’ time to pay the fees and accept the offer of admission. The candidates who have accepted admission offers will be notified to appear for registration, followed by document verification and payment of fees and on confirmation of admission a brief orientation program. Insofar, DAIICT has released the application form for the PG courses only. The information of the B.Tech Programme is as per the last year Information Brochure and for reference purpose only. As soon as the official information of the B.Tech Programme will release, the same will be updated here. If you have any queries, please ask in the comments below.